Hi and welcome to my review of Drop Gecko (cool name, right? ), Drop Gecko is a dropshipping app with which you will be able to build dropshipping stores with the click of a few buttons. As regular readers of my blog will know, I am a huge fan of the dropshipping business model and plan to start a dropshipping store soon. This is why I am constantly on the lookout for tools and services that will help me when I do eventually start a dropshipping business. I have reviewed a few dropshipping tools on this blog like AliDropship and Oberlo, Drop Gecko claims to have similar features and in this review, I will analyse how it stacks up against the competition. 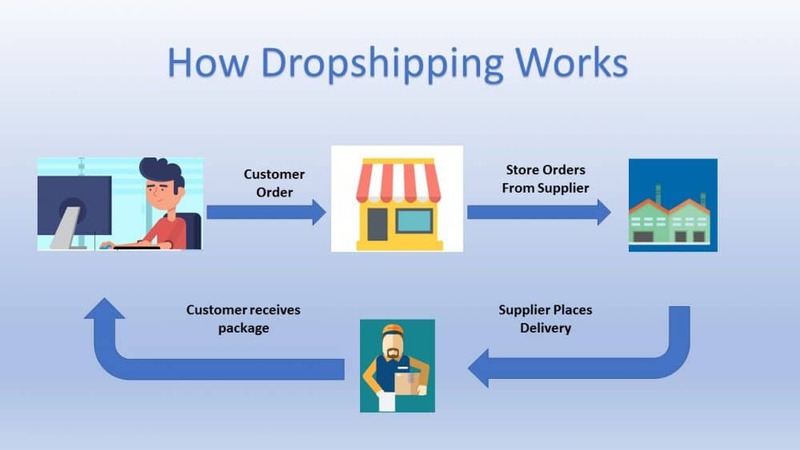 You probably have a good idea of how dropshipping works, for those who are not familiar with the business model, the brief explanation below should give a basic idea. Dropshipping is basically an eCommerce fulfilment method in which store owners do not stock or make delivery arrangements for the items they are selling. The diagram below will give a better visual representation of how dropshipping works. It’s a very popular method for those who may not have the budget to start a traditional eCommerce business and it can be very lucrative provided that you can find a product that is in demand. Drop Gecko was launched near the end of September 2018, the developers of this dropshipping software are a company called RTB Solutions. I am not really familiar with them, however, the face of the product is Cindy Donovan who is a well-known marketer and who has herself developed some good products. The basic idea behind Drop Gecko is to import hot selling products from Aliexpress into your Drop Gecko store and dropship them around the world (or wherever you want to). One of the main features of this app is One-click import which is a really good feature and saves you a lot of time from having to do it manually. It also comes with a semi-automated ordering feature that will allow you to place customer orders on Aliexpress without having to fill in their details. It has many other features other than just automatically importing and ordering products, however, I just want to comment on a couple of claims made on the sales page before I carry on with this review. I mentioned near the beginning that I am planning to start a dropshipping store soon, for this reason, I am always on the lookout for tools and services that will help me in this endeavour in the near future. You see, having read many blog posts, perused through forums, success and failure stories, the image below paints a deceptive picture of the steps required to start a dropshipping business. Yes, dropshipping is easy to get started with but if you have to do a lot of product research before you open your store. In fact, the majority of people will fail on their first time and one of the reasons many fail is because of insufficient product research. Drop Gecko has little material how on how to do proper product research and the sale pages make seem like all you need to do is fill your store with hot products and they will sell themselves, which couldn’t be further from the truth. Having said that, I do really like this software, there isn’t a big learning curve and it is easy to use, you could potentially start a dropshipping business in a few hours with Drop Gecko (I wouldn’t recommend starting one so quick). The main selling point of this software is how easy it is to start a dropshipping store with its one-click import feature and pre-made themes that will make your store look professional and easy to customise. Unlike the other dropshipping software applications that I have reviewed, Drop Gecko does not have Chrome extension through which you can import products from Aliexpress. Instead, you will have to download a file of all the products you want to sell in CSV or Excel format and then upload it into your Drop Gecko store. To download these files, you will have to open an affiliate account with Aliexpress and then in your affiliate dashboard, click on the button that says ‘hot products’. This will then take you to a screen like that as shown in the image below. You can then choose your category and then download the files of whatever products you want to sell. I honestly believe this is one of the weaker features, from my understanding, you cannot import a product you like, it must be items that are already selling well on Aliexpress. This is a flaw in the system, as products that are selling well on Aliexpress will not equate to that same product being profitable for your eCommerce store. This feature is pretty much in all the dropshipping apps now, still it is a very useful feature and one that will save you a lot of time. 2. Fixed – You add a fixed amount to every product. These prices will be automatically added to every single product you upload into your store, you can change prices for individual products manually if you want to. Although this is a good feature, the pricing options on Alidropship and Oberlo (the dropshipping apps I prefer) give you more options on how to price your products. You can choose from a set of 5 themes that have are well designed and look pretty good. You will be able to customise these themes to your own liking. You can increase the order value of your cart by offering one time upsells to your customers, upsells should be items that compliment the main product, so people will be more inclined to purchase it. When you purchase the Drop Gecko software, you will be given access to their Chrome extension with which will allow you to process orders through Aliexpress. The ordering process doesn’t too long and is also another plus point for this software. I really don’t know why they made this seem like a cool added feature when all the other dropshipping software apps have some kind of blogging service for free as well. Still, if you want to start ranking for some keywords and get some free traffic to your store, blogging on a regular basis could do that for you. If you are not too fond of starting a dropshipping business, or the thought of dealing with customers is not your thing, Drop Gecko has another feature that may be more suitable for your needs. Instead of importing products to dropship, you can import them as an affiliate and earn a small commission every time you make a sale. Although they list this as a benefit, I don’t really see it as one, I have been doing affiliate marketing for a couple of years now and let me tell you, it’s not as easy as they make out. You will not magically get customers to your store just by building an affiliate site, there is so much more to it but the sales page does not mention this. Like most products that are sold on the JVZOO platform, Drop Gecko comes with a few upsells, 4 to be precise. With the Pro version, you can integrate your Drop Gecko store with 4 autoresponders for email marketing purposes. Your product limit will be increased from 500 to 2000 and you get extra options for payment services. With the Pro version, you will also be able to create coupon codes and get more sales boosting features like countdown timers, limited stock notification, recent customer purchases and a couple of others. You will get your own eCommerce newsletter which will be written and sent out for you by the Drop Gecko team. You will have permission to create and sell Drop Gecko stores which is limited to 10 each month. 4. Reseller – $297 one time. Sell the software as your own and keep 100% of the profits minus 50% admin fee for any monthly subscriptions. Unfortunately, there is no training on how to properly run an eCommerce business. Although to be fair on them, the product does do what it says on the sales page (minus the easy money part). However, this is one of the reasons I will not be promoting this product because I do believe there are superior alternatives that provide way more resources and support and give you proper guidance on how to start a drpshipping business. I really like the Drop Gecko software, it has features that will be useful if you want to start a dropshipping business. The dashboard is easy to navigate and there isn’t a steep learning curve and with their premium themes, you can create a decent looking store without much design skills. Having said that, I do not like the suggestions made on the sales page that you could be easily making huge sums of money per month just with this software. I am not particularly fond of products that make income claims on the sales page, it gives potential buyers a false belief that all you need is this software and you will be making money. It’s a decent piece of software and does what it says, however, if you are new to dropshipping ( and most of you will be) this software will not be enough. This is why I will not be promoting it as I honestly believe there are far better alternatives to drop Gecko. Alidropship – A WordPress plugin with far better features and support, read my review of it here. Oberlo – The leading Shopify app for dropshipping and a far better alternative to Drop Gecko. Read my reviews of it here. Have you tried Drop Gecko? Would love to hear your thoughts on this dropshipping software. But what excellent information I have found here, and to be honest I didn´t know what is the dropshipping business, but now I have understood and it fascinated me, this is a very practical system and doesn´t require much time and effort. I hope you succeed with the model you want to make. I have to admit, drop gecko is a pretty cool name haha. I’m no expert of drop-shipping but even ive heard of Oberlo and shopify. Looking at the features you’ve listed for drop gecko though, I actually think its a solid software. I suppose the only problem is that it is overshadowed by the better ones out there. I’ve been looking into dropshipping for a while. Greko seemed like a good solution, but I’m glad I ran into your review. I was a little perplexed by some of the promises on their website. I’ve done affiliate marketing for a while, I know how much work needs to go into it to make it happen. I’ll spend my time reading about the alternatives you suggested. Thanks! I’ve never heard of dropshipping but I can see why it’s becoming popular. I rarely buy anything online but when I do I usually go to Amazon. Do these stores say that they’re a dropshipping store? Are their products at a better price? How do we find these types of business? You will not know when a store is dropshipping products, they will seem like any other eCommerce store. As for price, they will be broadly in range with other eCommerce stores that sell similar items. Drop Gecko is a relatively new product. Thanks for the heads up. I have seen plenty of successful drop shipping business but honestly, I am not a fan of drop shipping myself because I think digital products are easier to sell and the profit margins are higher. I also tried it with Alidropship a few years ago but my attempt was not successful and I had to forget the whole business and start over. Thank you for this review – it is very helpful otherwise I’d have to research these options myself. There is so much to learn on every aspect of an online store so your article saves time and money, especially for newbies who don’t know where to start and don’t know what they should be looking for. I have spent a lot of money on different software programs that I thought would make my life easier but sometimes they are so complicated, it takes so much time to figure out how to use the software that I just give up on it because it’s too hard. I think you will be successful in your mission of trying to help people avoid get rich quick schemes and scams if you continue to write honest reviews like this. Thank you for an honest and in-depth review of Drop Gecko. Sounds like a reasonable platform but from reading your reviews I see there are some obvious options that probably offer a better chance of success. I don’t like the feature of only choosing top selling items. Seems like you could be building a store similar to 100’s of others…so what’s the point. Like you said…if you do extensive product research you want to target those items to differentiate yourself in the market. I’ve been looking into drop shipping as a way to earn money online and have made a little money so far and I love this business model. It just seems like a great way for anyone to make some easy income. This Drop Gecko app looks like it could save me a lot of time and make drop shipping more efficient, but I’m just not sure I need it and it’s a bit too pricey for me. Do you know if Drop Gecko offers a free trial? I hadn’t heard of Drop Gecko but I too am starting a drop-shipping website and want to use a program that will give me full training. There are a lot of people out there offering training and I’ve read that if you don’t know what you’re doing it really will make the process more slow and complicated. I’m used to using Wealthy Affiliate as a training platform for Affiliate Marketing and am really hoping for training with drop shipping that would be just as comprehensive and with full support for building my online store. I’m so glad I came across this review as you offer a good look at the options out there. I’m sure with all your research you’re going to be quite successful when you open your store. It is an interesting review, by the way, I haven’t heard about Drop Gecko before. I am not very familiar with dropshipping but it is another option for the online business. You made a wonderful describe of this App. Now I understand a little more about dropshipping thank to your description about it. I think I will go deeper in dropshipping., maybe with some of your suggestions. Hi Minhaj , I have purchased Dropgecko and firstly did not realise I could not run it on my I pad , it’s not till you have purchased it do you realise it’s shortcomings , yes Ali express hot items ! All from china , they come with 20 – 30 day delivery ! Also you can only use Ali express . That is unfortunate, I hope you get it resolved quickly, it is a decent app but it has flaws that stop me from recommending it.